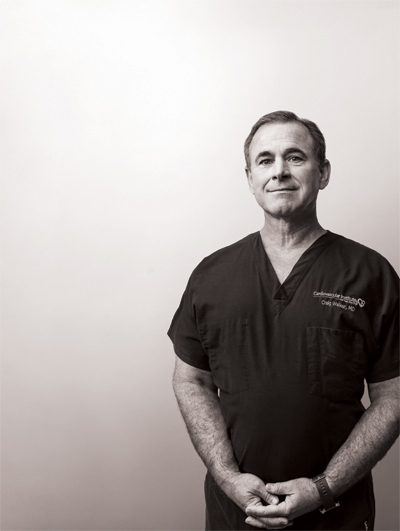 Interventional Cardiologist Dr. Craig Walker became interested in the medical field at just 8 years old. The youngest of nine children, the Bourg, Louisiana native was inspired by his two oldest brothers, who are also physicians. At age 12, he was a first responder to a severe automobile accident, and was heroically able to stop the bleeding with tourniquets made from his shirt while his friend called EMS for help. The trauma victim recovered thanks to his swift efforts, and Walker’s fate was sealed: He would become a doctor. After medical school, Walker initially went into internal medicine, because he wanted to practice general medicine with his brothers, but he soon became intrigued by cardiology. Over the course of his career, Walker has taken care of many patients who came to him as a “last resort,” he says. One of his primary areas of concentration is in salvaging limbs to help patients avoid major amputations. He also performs treatment of chronically occluded coronary arteries in patients who remain symptomatic with large areas of ischemia noted by perfusion studies. One of his toughest cases involved a 45-year-old man with multiple prior injuries, a history of heparin-induced thrombocytopenia syndrome (a deficiency of platelets in the blood which causes bleeding into the tissues, bruising and slow blood clotting after injury). The man also had a gangrenous foot. He arrived at Walker’s office for limb salvage. The patient refused to follow suggestions of getting his leg amputated above the knee — saying that instead, he’d prefer death. The surgery took seven hours but was ultimately successful. “Not only does the patient still have his leg five years later, but he’s able to walk with no limitations,” says Walker. Despite his accomplishments, Walker remains humble — a trait that helps him succeed.